If you find your energy dipping in the afternoon and you end up reaching for carbs, it may be because you haven't had a proper breakfast. Yes, it's true - breakfast is the most important meal of the day! Make sure you get plenty of protein at your morning meal to fuel and nourish your body for the day. Here's one of my favorite breakfasts to help you start your day on the right track! 1. In a small pan on medium heat, add oil and sauté greens. 2. In a small bowl, whisk eggs, sea salt, pepper, and red pepper flakes. 3. Pour egg mixture over greens. 4. Reduce heat and arrange cheese and prosciutto on top. Cook 2 – 3 minutes. 5. 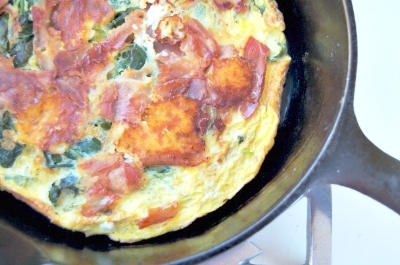 Flip frittata and cook 1 – 2 minutes (or finish under a broiler).